Fingon Rescues Maedhros - At Dagor-nuin-Giliath (Battle Under the Stars) where Fëanor was slain, his son, Maedhros, was also taken captive. Morgoth's goal was to get the Noldor to withdraw their attack, but they refused. So he displayed his prisoner in a most cruel fashion. 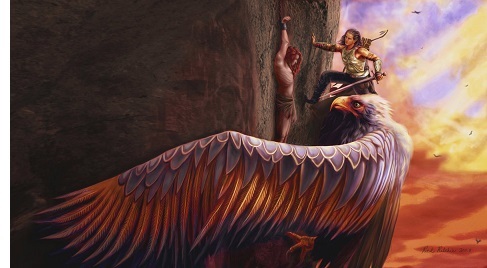 But there was one who endeavored to rescue Maedhros from his torment. Fingon the valiant, son of Fingolfin. Their friendship was ancient, but the divide between Fëanor and Fingolfin had separated them of recent years, and now Fingon saw a chance to heal that division. "High upon the shoulders of Thangorodrim he climbed, and looked in despair upon the desolation of the land; but no passage or crevice could he find through which he might come within Morgoth's stronghold. Then in defiance of the Orcs, who cowered still in the dark vaults beneath the earth, he took his harp and sang a song of Valinor that the Noldor made of old, before strife was born among the sons of Finwë; and his voice rang in the mournful hollows that had never heard before aught save cries of fear and woe. Thus was Maedhros rescued and the rift between the Houses of Fëanor and Fingolfin mended.